Automaker says plaintiff had her SUV repaired properly and she provides no valid arguments. 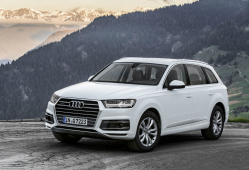 March 5, 2019 — Audi Q7 brake squeal problems don't warrant a lawsuit much less a class action lawsuit, says attorneys for the automaker in a motion to dismiss the complaint. According to the lawsuit, 2015-2018 Audi Q7 SUVs practically leave people deaf from loud high-pitched squeals when drivers hit the brake pedals. Plaintiff Valeria Mercado says she leased her 2017 Audi Q7 in January 2017 and by May 2017 the brakes were squealing whether the vehicle was moving in forward or reverse. The plaintiff alleges the loud noises cause distractions to drivers and pedestrians, an alleged problem one Audi technician said could be caused by brakes that cannot handle the weight of the Q7. According to the plaintiff, there is no way a $76,000 SUV should experience brake squeal problems. Mercado also says the automaker sent dealers three technical service bulletins about squealing brakes, an alleged admission Audi is fully aware of the problem. Obviously attorneys for Audi have problems with the arguments set forth in the lawsuit and claim the plaintiff has no valid claims about her brakes. In its motion to dismiss, Audi argues the plaintiff never alleges the brakes "functioned improperly or ever failed to slow down or stop the vehicle in the time and manner in which she intended." Audi also points out the plaintiff mentions what a dealership allegedly told her but she never says which dealership was involved. Then on November 21, 2018, less than two weeks after the plaintiff filed the class action lawsuit, she brought her Q7 to a dealer about brake noise. Attorneys for Audi say technicians fully fixed the brake squeal free of charge. According to the service invoice, the “brake noise” of which the plaintiff complained “is no longer present.” In addition, Audi says the plaintiff hasn't complained about brake noise since the repairs were performed. Audi's attorneys also say the entire lawsuit fails to plead any facts that establish any of her claims as the plaintiff never identifies any defective brake parts on her Q7 or any other Q7. Audi further argues the plaintiff tries to make brake "noise" equal a brake "defect" without any legal basis because brake pads and parts are "wear and tear" parts. As such, they are expected to wear out and make noise over time due to multiple reasons not related to brake defects. In the motion, attorneys for Audi say the plaintiff claims the brake noise is distracting but she pleads no facts to support the brakes are a safety-related problem. Additionally, the lawsuit doesn't claim the plaintiff or anyone else ever experienced anything close to a crash due to the brake noise. The Audi Q7 squealing brakes lawsuit was filed in the U.S. District Court for the Central District of California, Eastern Division - Valeria Mercado, et al., vs. Audi of America, LLC, et al. The plaintiff is represented by Ahdoot & Wolfson, P.C., Greg Coleman Law, and Whitfield, Bryson & Mason.